There used to be an assumption only older people had to deal with dry eyes, but these days people are realising it’s a more common issue than once thought. People as young as 20 years of age are coming to Visual Q Eyecare complaining of dry eyes, a gritty feeling in their eyes, or exhibiting symptoms of red eyes, or even ironically, teary eyes – if you don’t have enough oil component in your tear film to hold the water component in place, the eye can become watery. Who ever thought teary eyes could actually be a symptom of dry eyes? Using optical amplification you can easily see the difference between a healthy eye and a dry eye. It was difficult for eyelid scrubbing to be very effective on its own, as it’s hard to put much direct pressure on the eye. The process also takes a long time before you can see results – after you massage/clean your eyelids on a daily basis, we check the eyes every few months to see if any improvements have occurred. While effective in the long run, it’s a time consuming process, and we always felt something was missing – like a compliance issue wasn’t being addressed. 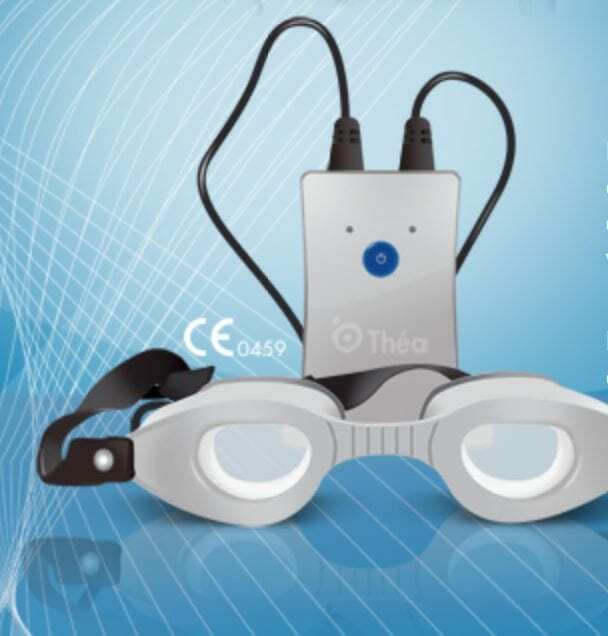 Visual Q Eyecare’s new in-house treatment is called Blephasteam, and it’s a specialised goggle that heats the eyelids up to a constant higher temperature. This melts the eye oil, allowing the optometrist to squeeze out bad oil stuck in the oil gland – a little like squeezing a pimple. Blephasteam Goggles heat up clogged oil ducts so fresh healthy oil can enter the tear film. The Blephasteam process is more effective than previous methods, and it takes much less time to achieve results. After only a few 10-minute sessions the eyes feel better, and become noticeably whiter in appearance. From my own experience, I often had gritty eyes (it felt like there were eyelashes stuck in my eye, even when they weren’t there), but after treatment this feeling has lessened greatly, overall comfort has improved, and my vision is clearer. Patients of Visual Q Eyecare have spoken of feeling less pressure on their eyes, less tiredness of the eyes, and clearer vision. To see if this new dry eye treatment is right for you, a good optometrist is needed to first ascertain your exact eye problem, and its subsequent treatment. If you are diagnosed as having dry eyes and this treatment deemed the most effective for your specific issue, it can be extremely beneficial. Combined with changes to your diet, supplements (E.G ‘Thera Tears Nutrition Omega-3 Supplement’ is great for boosting up the eyes’ tear reserves), and the eyelid scrub, the majority of patients report their dry eye problem as greatly improved, if not cured altogether. It should also be noted Blephasteam can also slowly reduce and then remove sties or cysts formed by clogged up oil glands in the eye. Call Visual Q Eyecare now to see if your days of having dry eyes are about to come to an end! One Response to Amazing New Treatment for Dry Eyes! I’m amazed, I have to admit. Seldom do I encounter a blog that’s equally educative and entertaining, and let me tell you, you’ve hit the nail on the head.